It sounds like an old joke: how do you get a group of people to do what you want? IÃ¢â‚¬â„¢m on the road playing drums with a singer/songwriter named Jesse Marchant, driving across the country from New York in a big, black, creeper vanÃ¢â‚¬â€Jesse, me and two other musicians. In the months leading up to the tour, I never bothered to check the RedsÃ¢â‚¬â„¢ schedule against ours because I didnÃ¢â‚¬â„¢t think weÃ¢â‚¬â„¢d have any time, and because my three companions are not sports fans. But sure enough, we had a small warm-up show Monday night in Rock Island, IL before a day off on the way out to Denver, CO. Johnny Cueto was on the mound for a Tuesday night game against the defending American League Champion Royals in Kansas City, 5 and a half hours south of Rock Island, and about 8 hours east of Denver. 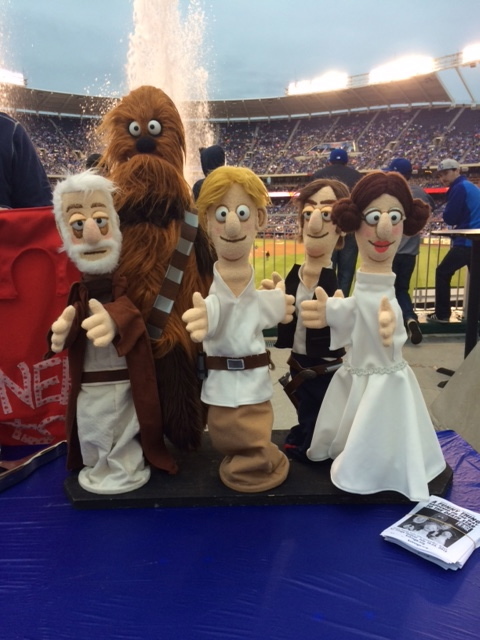 I started cracking some half-jokes about going to a baseball game along the way and was met with lukewarm chuckles. 8 hours is a long time to be in a car when you have to play that night. But over breakfast Tuesday morning, I decided to play hardball. They went for it and there I was in a grocery store in Davenport, IA doing what no nervous, impatient, technologically inept person should do: trying to buy baseball tickets on my smartphone. IÃ¢â‚¬â„¢ll spare you the details. On the drive down I-80 and I-35 I saw Mesoraco was in the lineup, a rare treat this year. We didnÃ¢â‚¬â„¢t have time to do anything but go straight to the stadium so I wasnÃ¢â‚¬â„¢t able to check out any of the great BBQ IÃ¢â‚¬â„¢ve heard about in KC. 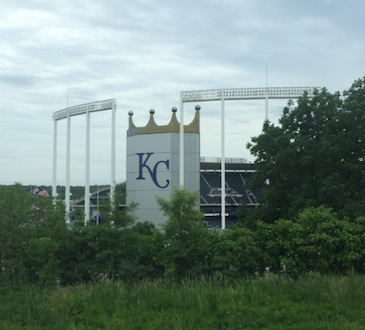 Kauffman Stadium has more of an open, flat feel to it than many tall and rounded stadiums IÃ¢â‚¬â„¢ve been too, but you canÃ¢â‚¬â„¢t miss the massive KC wall from I-70. The RoyalsÃ¢â‚¬â„¢ and ChiefsÃ¢â‚¬â„¢ stadiums are right next to each other so I assume they never schedule home games at the same time in September or October. And there isnÃ¢â‚¬â„¢t much else around so there was quite a bit of tailgating in the parking lot. Everything was organized and parking was quick and easy. I was struck immediately by the percentage of people in Royals attire. Maybe IÃ¢â‚¬â„¢ve been in New York too long, but IÃ¢â‚¬â„¢ve been to games at many stadiumsÃ¢â‚¬â€IÃ¢â‚¬â„¢ve been to Wrigley and Fenway and Yankee StadiumÃ¢â‚¬â€and the percentage of people in home team attire here crushed them all. My guess would be 80% of the people I saw, and I donÃ¢â‚¬â„¢t think IÃ¢â‚¬â„¢m exaggerating much. We entered onto their outfield promenade while the Reds were just finishing batting practice. There were several booths and attractions to keep kids and adults entertained before the game, but I was interested in seeing Joey take a couple cuts so I walked right past the king and queen greeting people and the make-a-shot-win-a-prize basketball hoop. It really is a nice open outfield area, thereÃ¢â‚¬â„¢s no view like GABP has, but itÃ¢â‚¬â„¢s a nice place to walk and socialize. 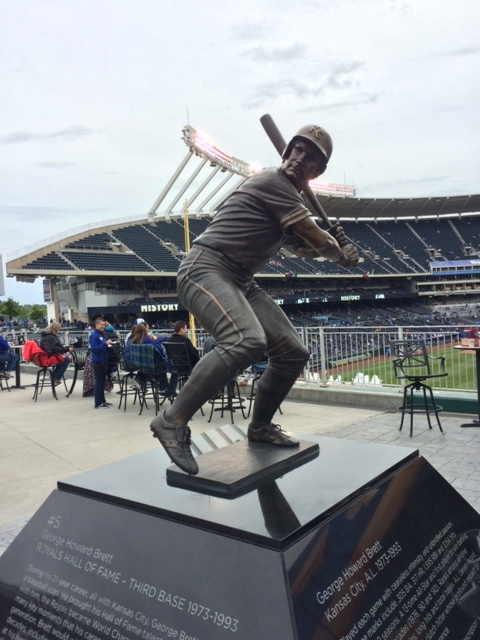 I liked this statue of the great George Brett. We want up to the 2nd level to sample some craft beer. 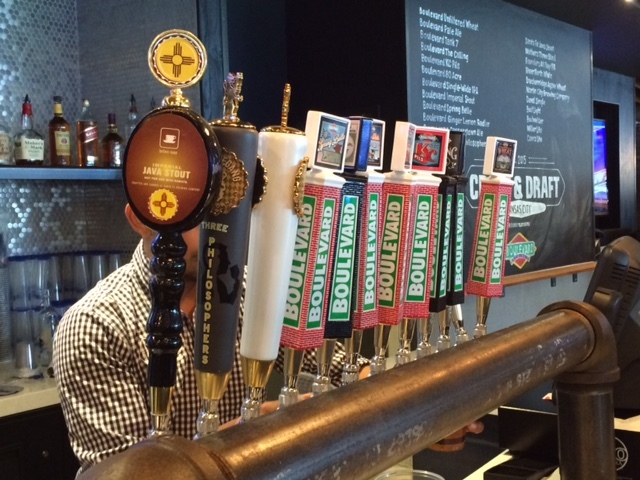 I tried the Boulevard Pale Ale, which was refreshing but not as hoppy as most IPAs. One friend had the Boulevard Single Wide IPA and loved it. We got some pulled pork sandwiches and found our seats in section 245 down the first base line. Since I was a kid I wanted to see the waterfall. When I think of each MLB baseball park being unique I usually think of the green monster in Boston and the waterfall in KC, so it was nice to finally see it. 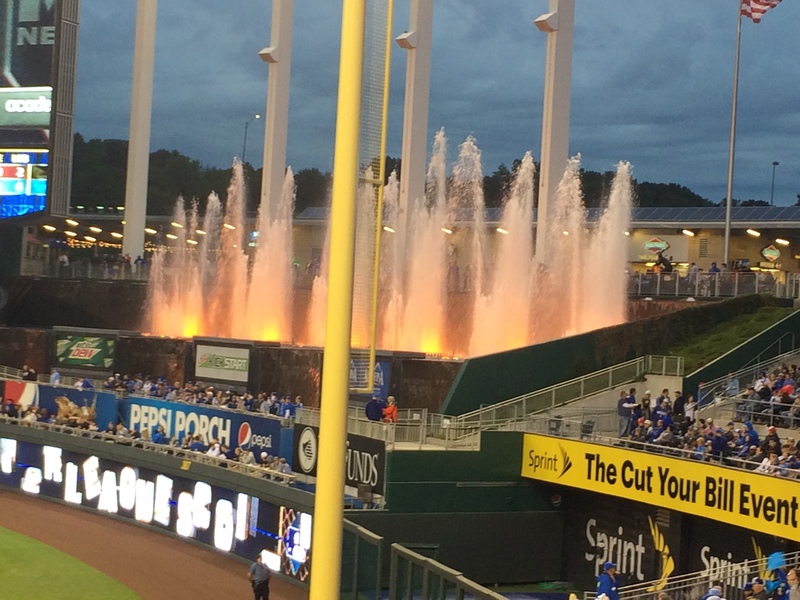 It changed to an orange color a few times between innings, but I didnÃ¢â‚¬â„¢t get to see what happens when a Royal hits a homerun. I wish I had since the Reds lost anyway. IÃ¢â‚¬â„¢ll try not to comment much on the Reds offense. A telling moment: my non-fan friends enjoyed having me comment something about each Reds batter as they came up to bat. Upon Zack CozartÃ¢â‚¬â„¢s 4th at-bat I barely had time to get out the words Ã¢â‚¬Å“how much you wanna bet he grounds it to the left sideÃ¢â‚¬Â before he bounced the first pitch to Escobar at short. Royals fans love Moustakas, even yelling Ã¢â‚¬Å“MuuuuusÃ¢â‚¬Â when he made a play at 3rd, and he delivered that night, taking what Cueto offered him and driving it where the RedsÃ¢â‚¬â„¢ outfielders were not. 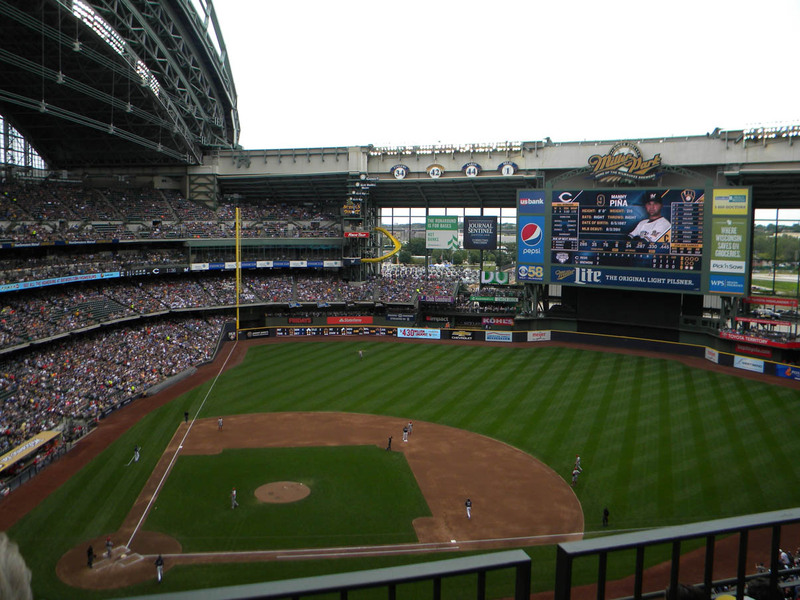 As I said, the stadium had a sort of flat feel to it, I donÃ¢â‚¬â„¢t know if the slope of the seats is any different than any other stadium or if IÃ¢â‚¬â„¢m just learning that itÃ¢â‚¬â„¢s not great to sit way down the first base line on the foul side of the foul pole. Obviously people were walking up and down the nearest aisle to us the entire game and each one obstructed our view of the plate on the way. This was also my first game of the year and as IÃ¢â‚¬â„¢ve read, the new rules really do speed things up. The game started at 7:10, the fifth inning began at 8:14 and we hurried through the parking lot before 9:30 as the crowd cheered the final strikeout. The game had the feeling of a concert or a short play more than an evening at the ballpark. ItÃ¢â‚¬â„¢s nice that things roll right along, but I canÃ¢â‚¬â„¢t help but think itÃ¢â‚¬â„¢s more for the benefit of the teenagers that were taking selfies and standing in the aisles chatting than someone like me that was taking in the experience and hanging on every pitch. Between innings they had a Ã¢â‚¬Ëœkiss camÃ¢â‚¬â„¢ like you see everywhere, but they also had a Ã¢â‚¬Ëœhairdo camÃ¢â‚¬â„¢, which IÃ¢â‚¬â„¢d never seen and found amusing. And through the eyes of my friends that donÃ¢â‚¬â„¢t go to baseball games, seeing the crowd’s excitement over the hotdog race on the jumbo-tronÃ¢â‚¬â€ketchup versus mustard versus relishÃ¢â‚¬â€was strange and comical. During the 7th inning stretch, Ã¢â‚¬Å“Take Me Out to the BallgameÃ¢â‚¬Â was sung unenthusiastically by one of the teenage girls that danced on top of the dugout and threw t-shirts between innings. As you know, the game itself didnÃ¢â‚¬â„¢t provide a lot of excitement. Johnny Cueto Ã¢â‚¬Å“did his jobÃ¢â‚¬Â, but didnÃ¢â‚¬â„¢t have his best stuff, and the offense really only threatened once. Leaving was as organized and simple as arriving and we were on our way. I hope I get to come back, have some real KC barbecue before the game, and sit closer to the plate where IÃ¢â‚¬â„¢ll feel a bit more in the thick of it all. Dear Reds: Shake it off. You can still win. Thanks. I always enjoy learning about the atmosphere and a stadium I’ve never been to. The Reds will not play KC again until 2018. That is a snazzy Brett statue! I like it! 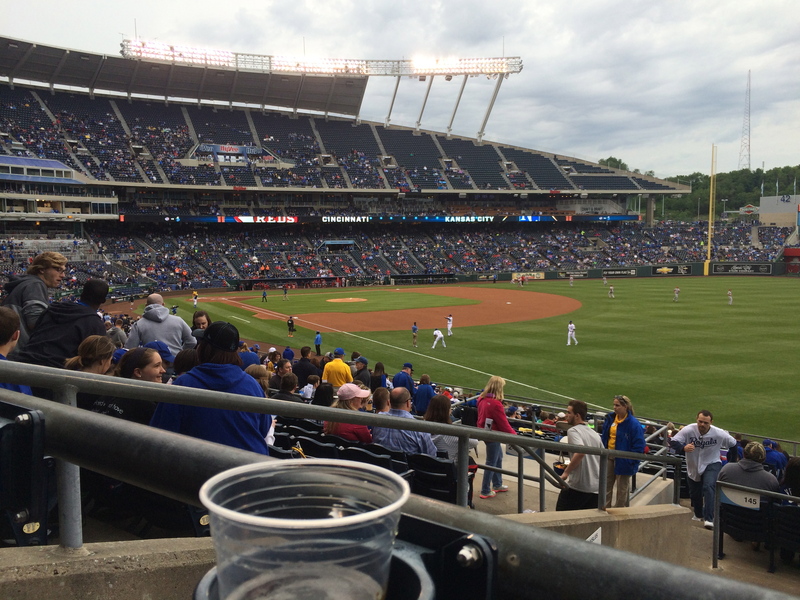 I went to Kauffman for a couple of games years ago. The Reds weren’t playing there, I just happened to be in KC for a conference. I agree it was beautiful. I bet the atmosphere is electric now because of the team’s recent success. Great post, Jason. 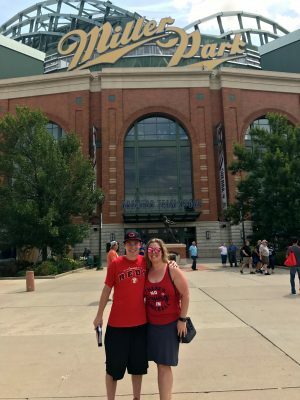 Really enjoy reading these accounts of trips to other stadiums. The Royals have always been a class organization. At least that is what my dad used to say. He always wished that George Brett would have come over to the Reds as a hitting instructor and teach our organization the fundamentals of plate discipline. Many people bought into that whole Charlie Lau school of hitting. As far as I know only George Brett dominated with it and maybe Robin Ventura. Ok so there were quite a few more batters that succeeded with the Charley Lau approach. Why is it that his methods are not emulated today? Not sure. But Walt Hriniak, former White Sox hitting coach, was a Lau disciple. Frank Thomas came around about that time and embraced it. 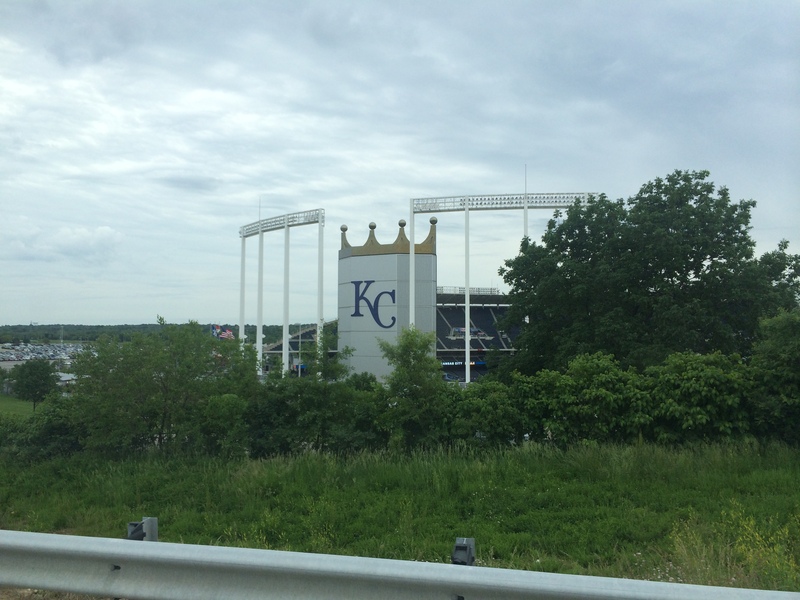 I drove to KC for both games & was actually underwhelmed by the park. I was hoping for something a little more idyllic and less of a college tailgating concrete wasteland. I was also perturbed they held you outside of the gates until an hour before the first pitch. I can understand that. There’s nothing to do or look at around the stadium. I didn’t know they held people out so long. And the fact that it’s so open gives it kind of a small (certainly not idyllic, as you say) feel. And the waterfall was not what I imagined as a 5 year old, but how could it be? Once I’m in my seat with a beer and maybe some decent food, I’m good to go, so if the parking and leaving is easy, the crowd is good and baseball is happening, I’ve gotten what I came for. I think I had romanticized that park for some reason. Maybe because it’s one of the older ones. I agree though — beer and baseball are enjoyable regardless.